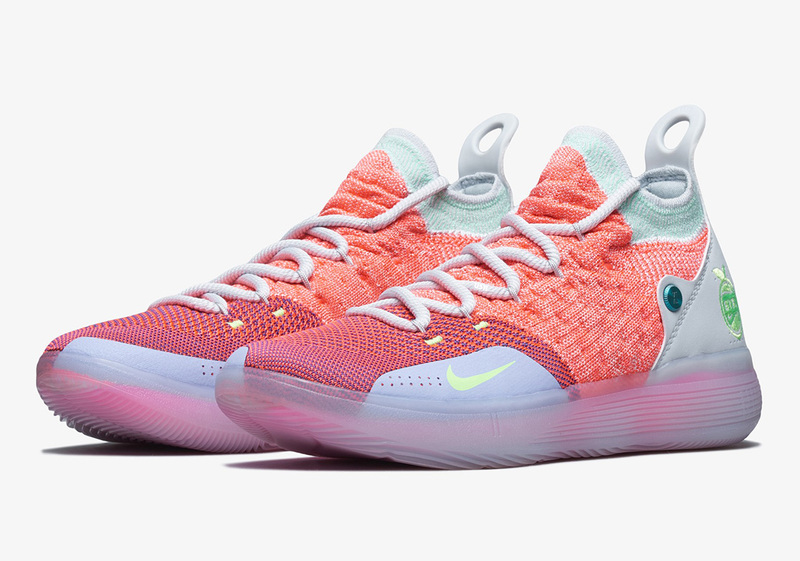 Last week, we brought you a first look at the Nike KD 11 “EYBL” colorway to continue the Swoosh brand’s longstanding collection of dedications to the youth hoops organization. Dressed in a vibrant color scheme, the Nike KD11 utilizes a recurring embroidered peach logo that is designed to honor the annual Peach Jam basketball tournament in Georgia. Hot Punch acts as the catalyst for this sneaker’s colorway, while Lime Blast and Pure Platinum provide supporting details that lend to a color scheme that is perfect for the middle of the Summer. The semi-translucency of the KD 11’s react cushioning sole unit acts as a window to another Hot Punch element to match the look of the rest of the sneaker. Enjoy an official set of images for this brand new “EYBL” offering and expect its arrival at Nike Basketball retailers on July 13th.